Product #60833 | SKU Z7 | 0.0 (no ratings yet) Thanks for your rating! 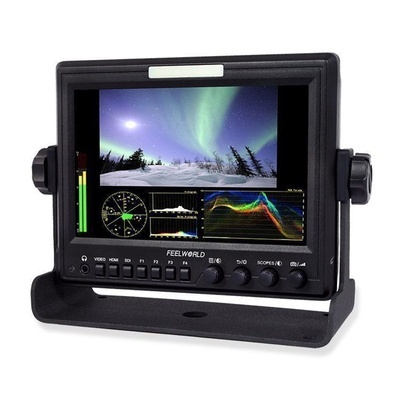 A compact battery powered field monitor with a 16:10 native aspect ratio, and a wide variety of signal scopes. The FeelWorld 7" Aluminium Design IPS 1280x800 Camera-Top Monitor is a compact battery powered field monitor with a 16:10 native aspect ratio, and a wide variety of signal scopes that allows you to customise your display to suit changing needs depending on the job. It features a mode that tiles histogram, audio bar, vector, RGB histogram, and YUV waveform in a border surrounding your video image, allowing you an unobstructed view of your video and scopes at the same time. The IPS panel features a native 1280 x 800 resolution that scales to fit HD and SD images, in NTSC and PAL, over SDI and HDMI connections. Z7 Build-in HDMI to SDI Conversion, is used to broadcast and deliver the HDMI camera video. The monitor features two separate anamorphic modes, a 1.33 and a 2.0x squeeze, allowing you to view your footage unsqueezed, even if your camera doesn't unsqueeze the output. The monitor provides a 178° viewing angle without noticeable colour or contrast shift. You use the front mounted knobs to select which scopes you wish to display, as well as choose from a variety of safe area markers as well as peaking and zebras. You can select to display audio level meters on the side of the monitor if you wish, or monitor the audio from the built-in speaker or headphone jack. The monitor is powered from 4-pin XLR connector, or 12V DC coax input with the included power adapter, and Z7 has flexible battery systerm that supports F970, LP-E6, D28S, Anton, Sony V mount plates of your choice.